October 4 2016. 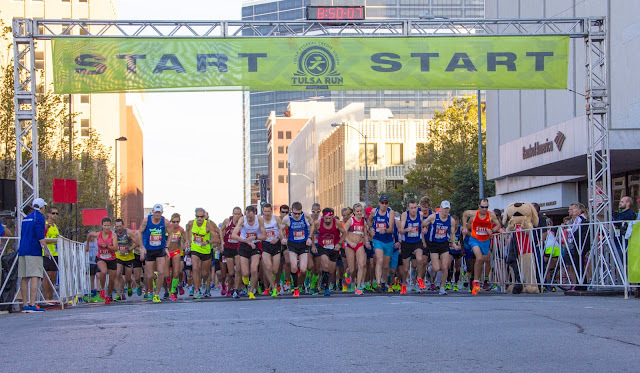 Top Masters Long Distance Runners from all over the US came to Tulsa on October 29th to contest the USATF 15K Championships at the Federal Credit Union Tulsa Run. 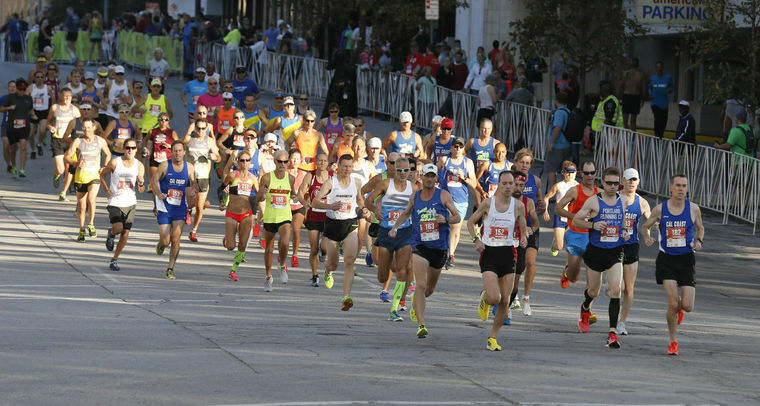 The historic 15K course here was relatively flat and fast but since 2014 the course was rerouted due to redevelopment of Tulsa’s riverfront area. It is very hilly. Sometimes the weather cooperates and we get a gorgeous day for running, like last year. Other years, like 2014 and this year, the weather turns sunny and warm, not so good for fast times over a 15K. And there were 10 mph winds. As usual, the Federal Credit Union Tulsa Run was a great host in this repeat of an annual event since 1978. Some runners were cautious in their approach to the hills and the weather, hoping for better days ahead, while others threw caution to the wind, resulting in some inspiring performances. 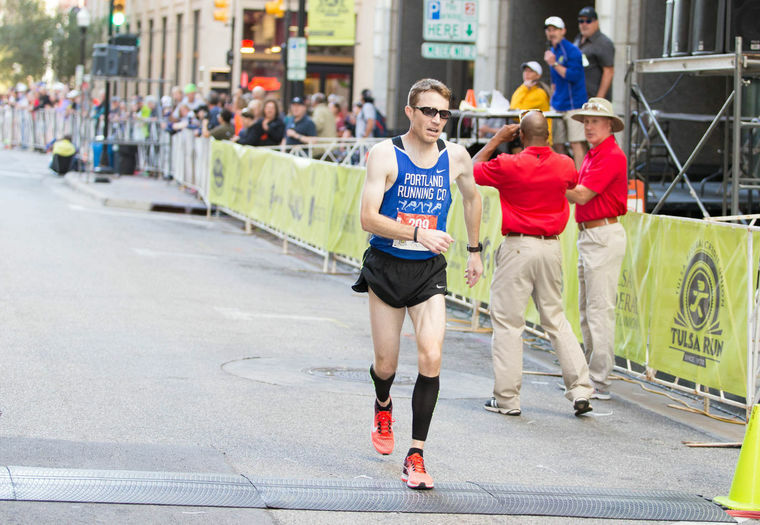 Two athletes went for a US 15K record despite the hills and weather. Libby James claimed the US 5K record for Women 80-84 on October 2nd at the Masters Championship in Syracuse. She was going for two in a row with this race, undaunted by the hills and weather. Based on her time this year in the Bolder Boulder 10K it looked as if she had room for error. The record is 1:29:01. 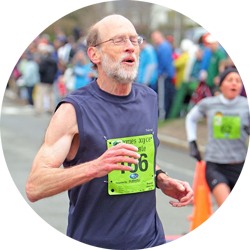 Using the Age-Grading calculator, one can conclude that James’s 10K performance of 55:06 was roughly equivalent to a 1:24:37 in a 15K race. Of course one does have to run the extra 5K, not a piece of cake. James on the other hand, got her record. She hit the 5K in 27:17, the 10K in 54:41 and brought it home in 30:25 for a final time of 1:25:06. That last 5K split shows that the heat and the wind took its toll on James too, but she had enough in the tank to break the record by nearly 4 minutes. It was another phenomenal performance by James. Ever gracious, James reminds us to enjoy and take advantage of our healthy times...and to be patient when necessary, "I am so delighted to have had the chance to come to Tulsa and do the race. It was probably more meaningful to me because a year ago last summer I was training for it when I injured my Achilles. It happened in August and I couldn’t run much at all until March. Feel so fortunate to have been able to train for it this fall. It is a famous race and one I’ve wanted to do for quite a while. I did know the course was hilly—and it lived up to its reputation! A personal sidelight that made it special was driving nearly 12 hours to Tulsa with my daughter, Kristin, who leads a busy life and loves to run. She did the 15k also and we had a rare few days to hang out together—in the car and in Tulsa. She lives in Cheyenne, Wyoming. One of my favorite things about running is the fact that a high percentage of my four kids and 12 grandkids are runners. I’d like to think I’ve had something to do with that." The race to be the first Masters Athlete across the finish line was a dandy for both Men and Women. Defending Champion, Greg Mitchell, at his first National Championship race since the 8K in February, led a 3-athlete pack out from the start. Last year’s second place finisher, John Gardiner and newly minted Masters Runner, David Angell right on his shoulder. All three crossed the 5K mat in 16:15. Shortly after that, the race swings around a 180 degree turn and heads back on the opposite side of the road. That’s where Mitchell made a decisive move. He hit the 10K mark in 32:43 with 14 seconds on Gardiner who, in turn, had another 14 seconds on Angell. There was one tough uphill in that stretch. The last 5K is pretty flat until the runners cross first the Arkansas River and then the interstate. After the River bridge there is a sharp, short hill, followed by a gradual incline back up into Tulsa’s downtown. And that is where the heat finally got to Mitchell and the wheels came off. Gardiner passed him on the incline and collected his 2nd National Championship in 3 months. A 1 Mile and a 15K championship make nice bookends! Mitchell made an incredible effort to keep his race going all the way to the finish line where he was immediately escorted to the medical tent. [Luckily no permanent damage as Mitchell was hobnobbing with his peers at the Awards ceremony.] Gardiner’s gun time was 50:01, over a minute faster than his 2015 time, so he definitely earned the win! Mitchell got the Silver Medal in 50:47, with Angell 11 seconds back and closing fast in third place. 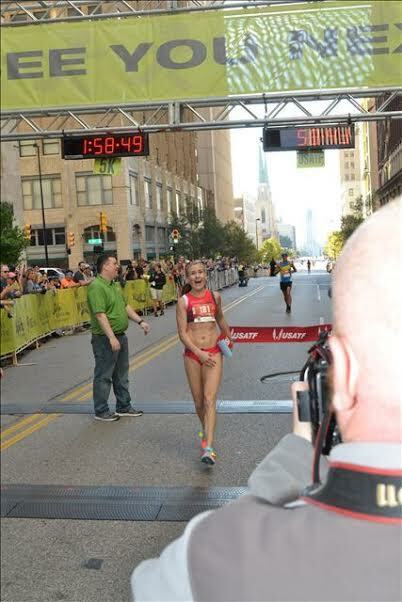 Melissa Gacek, Masters Winner of the 2016 Fifth Third River Bank 25K Run, knew she had two tough runners to beat. 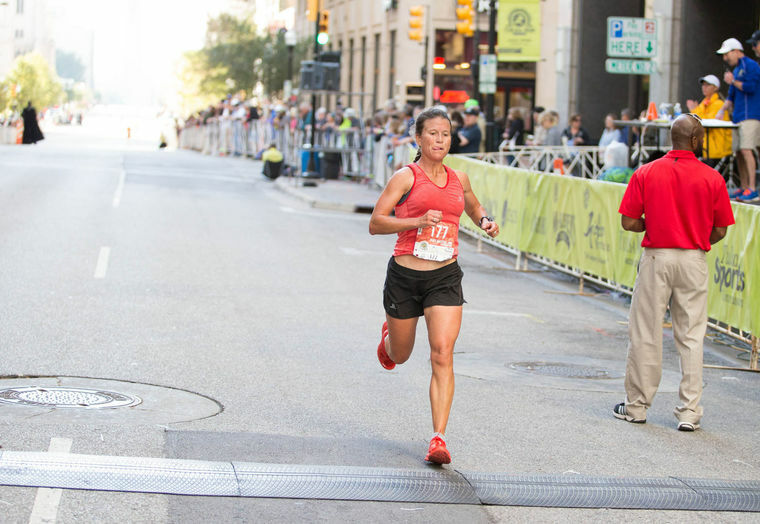 Fiona Bayly took the Masters title at this year’s New Balance Bronx 10 Mile Run and the Brooklyn Half Marathon. 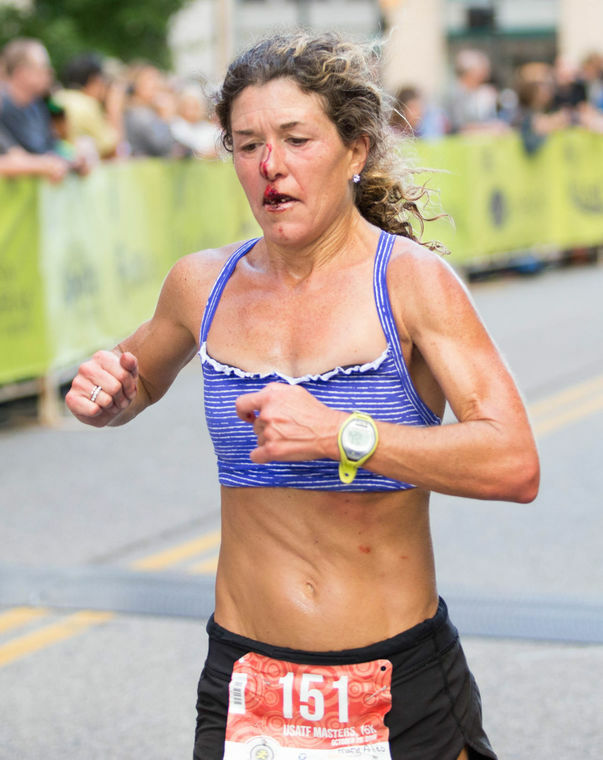 Melody Fairchild was the 2014 Masters 15K National Champion and, four years ago, took 8th place in the World Mountain Running Championships. Gacek wasted no time as she created a small gap after the second major hill. At the first 5K Bayly was tracking Gacek only 5 seconds back. Fairchild was a half-minute back at that point. One mile later there is another major hill and then a reprieve as runners coast down toward the 10K mark. When they got there, Gacek had widened her lead to 22 seconds. The last 5K is fairly flat until runners re-cross the Arkansas River and kick up toward the downtown area. That is a stretch where runners who have held back on the hills can sometimes stretch it out and catch an early leader. But not today, as Gacek held strong all the way to the finish to win in 58:44, with Bayly second in 59:40 and Fairchild third in 1:00:00! The winner, Gacek, offered her perspective: "So honored to end the season on a high note with a national title in a great field. It was definitely the most challenging race I've done. I am thankful to Heath Aucoin at Tulsa Run, my coach Stephanie Bruce, and my sponsors, including Discover Strength, for all their support this year!" Naturally Libby James topped the Women’s Age-Grading competition and Brian Pilcher the Men’s. James and Edie Stevenson both had World Class performances, over 90%. James hit 96.5% and Stevenson 90.41%. It is quite impressive to turn in a World Class performance on that course on that day. Age-Grading makes no allowance for the difficulty of the course or the weather conditions. Stevenson kept her streak going; she has had a World Class performance in each of the 5 National Championship races she has run this year. Jo Anne Rowland returned to the Age-Grading podium with an 88.55%. Nat Larson ascends the Age-Grading podium in almost every race he competes in and this race was no exception. Pilcher registered a 90.73% but Larson was next at 87.68%. William Moore upped his game this year; he ran two minutes faster and captured 3rd with 87. The top 3 finishers in each division are given below. I focus on the Division races that were tight contests or had another element that caught my attention. The Men’s 40-44 race was as above for the Overall Race in that Gardiner, Mitchell and Angell are all in that group. The top of the Women's 44 was the same as above with Gacek claiming the win but Fairchild moved up to second in the division because Bayly is in the W45’s. 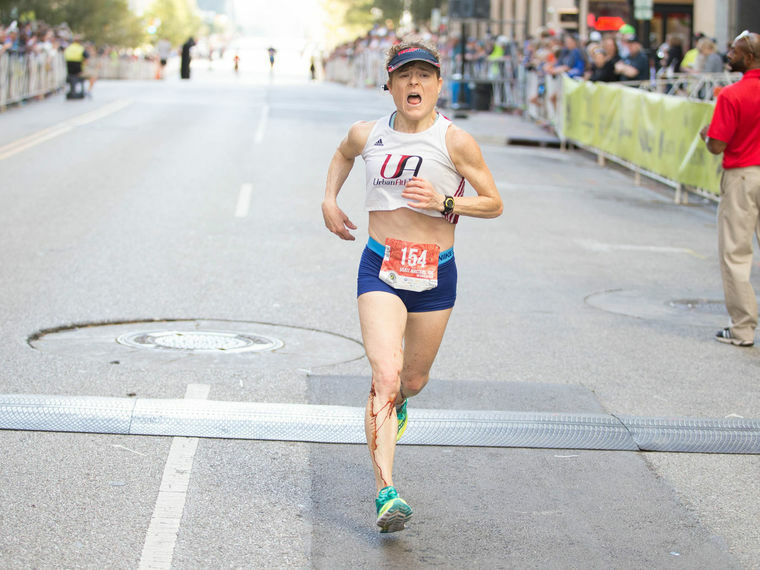 Christy Peterson, who finished 5th at the 5K Masters Championships, found the longer distance more to her liking as she fought off two tough competitors, Kristina Pham, an ultra-marathoner, and Jennifer Pfaff, who, like Peterson, had a strong half marathon earlier in the year. Peterson took 3rd in 1:02:43, with Pham 20 seconds back and Pfaff, on an off day, 2 minutes behind Peterson. The Women’s 45-49 race was taken by Fiona Bayly who also finished 2nd overall in 59:40 but Terri Rejimbal showed that she was all the way back from an injury that kept her off the roads for much of the spring and summer. Rejimbal made it surprisingly close with a 1:01:03, losing by less than a minute and a half, beating her 2014 time by 42 seconds. The Men’s 50-54 race was a humdinger! The lead pack was expected to be Rob Arsenault, Nat Larson, and a fellow from Texas who rarely runs in national championships, James Jackson, Jr. No one really anticipated the terrific performance of William Moore, another Texan by the way. So at the 5K mark, Arsenault and Larson thought that Moore, who was right with them, was Jackson but they had no idea who the ‘other guy’ ahead of them with the M50 on his back was. That was Jackson who crossed the 5K mat in 17:43, some 25 seconds ahead of the chase pack consisting of Arsenault, Larson and Moore, all crossing the mat in 18:08, along with special guest, Pilcher. The chase pack hoped to cut into Jackson’s lead over the next 5K but instead Jackson upped his lead by another ten seconds, crossing the 10K mat in 35:24 with the 3-athlete chase pack 53 seconds back now. Larson went after Jackson but the runner from Texas held onto a 26 second gap at the finish line in 53:43, with another 17 seconds back to Moore. Arsenault cruised in 19 seconds behind Moore. The Women’s 50-54 was interesting in part because it was a tight contest between Mary Alico and Kathleen Cushing-Murray. But it got a whole lot more interesting when, about 100 meters into the race, Alico got tangled with or clipped by another runner and went down hard on the pavement. With blood dripping from her face and legs, one might have thought she would call it a day. But she is a fighter; she got up, dusted herself off and took off after the rest of the competition. Alico caught and passed Cushing-Murray in the first 5K and was never headed after that, winning in 1:02:45 to Cushing-Murray’s 1:04:00. Fred Zalokar took a break from his quest to win his age group at all of the Major World Marathons to compete in Tulsa. So far he has won all but Tokyo. And he was not denied here although there was a strong Men’s 55-59 field. Zalokar took 1st in 55:25 with William ‘Hugh’ Enicks in second place two minutes back. Those 95 Individual Grand Prix points, however, give Enicks 440 total and an almost insurmountable lead in that season long race. No one else has even 300 points. Local Tulsa runner, Terri Cassel, got a solo win in the Women’s 55-59 group but ran a very creditable 1:05:00 that generated the 6th highest age-graded score among all of the women running. Men’s 60-64 was of interest, in part, because of Brian Pilcher’s attempt for the US record. His presence made the race for the individual gold medal almost a forgone conclusion but the race for the remaining two podium positions was tight and, more importantly for the participants, the M60+ team prize was fiercely contested by two teams. The Cal Coast Track Club’s M60+ team entered the race leading the Boulder Road Runners by 20 points in the Club Grand Prix and Boulder was determined to take at least a ten point bite out of that lead by defeating them in this race. Boulder was pretty confident until they learned that one of their top three runners would not make the race due to sickness. That made it a pretty close contest in their minds. Every runner would matter. It was Kyle Hubbart, Bruce Kirschner, and Dan Spale for Boulder vs. Perry Forrester, John Holcomb, and Keith Witthauer for Cal Coast. Boulder also had Mark Donelson as insurance in case any of their first 3 ran into trouble. Holcomb and Forrester went out like they expected to claim the victory. They hit the 5K mark in tandem in 19:53 with their teammate, Witthauer 19 seconds back. The Boulder runners were more conservative with Hubbart 19 seconds back from Witthauer, Kirschner 3 seconds back from him and Spale 10 seconds behind them. I learned later that Spale’s shoelace came undone; it must have been in this first 5K. Once Spale caught up with Hubbart, those two pushed in tandem to catch and then pass the Cal Coast guys, leading Forrester by 7 seconds and Holcomb by 14. But Witthauer, their last scoring runner came across the mat nearly two minutes ahead of Kirschner. Since the team race is determined by adding the times of the first 3 runners, Cal Coast was still in the lead at this point. Spale and Hubbart pulled away over the last 5K with Spale claiming the Silver Medal in 1:00:26 and Hubbart 11 seconds back with the Bronze medal. The question then was how far back to the Cal Coast guys and how the battle between Witthauer and Kirschner ended. It was very tight; in the end Kirschner took a half minute out of Witthauer’s lead and Boulder took the team Gold medal by two and a half minutes! Andriette Wickstrom, the strong Marathoner from Storm Lake, Iowa, took the Women’s 60-64 title in 1:10:55 with a wide margin over Jill Miller-Robinett. But Miller-Robinett was happy with the silver medal and helping her Impala team to another Team title and another 100 points in the Club Grand Prix contest. Her teammate, Jo Anne Rowland, had the same incentives in mind but also got a little closer to the remarkable Edie Stevenson in the Women's 65-69 division than she has in the last few races. Stevenson clocked 1:12:30 to Rowland’s 1:15:11. Tom Bernhard put it on cruise control once he found out how warm it was going to be; he won the men’s 65-69 division by 7 minutes in 1:00:45. Richard Kutzner took the men’s 70-74 by a large margin. 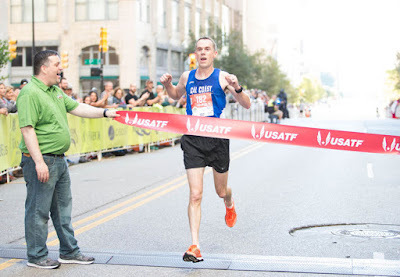 Paul Carlin, who bested Kutzner at the 5K, had an off day and did not challenge. Last year Phillip Kroll ran a minute slower than Fay Bradley when they were in different divisions. This year Kroll moved up to the 75-79 division and ran 4 minutes faster than Bradley to win in 1:28:08. 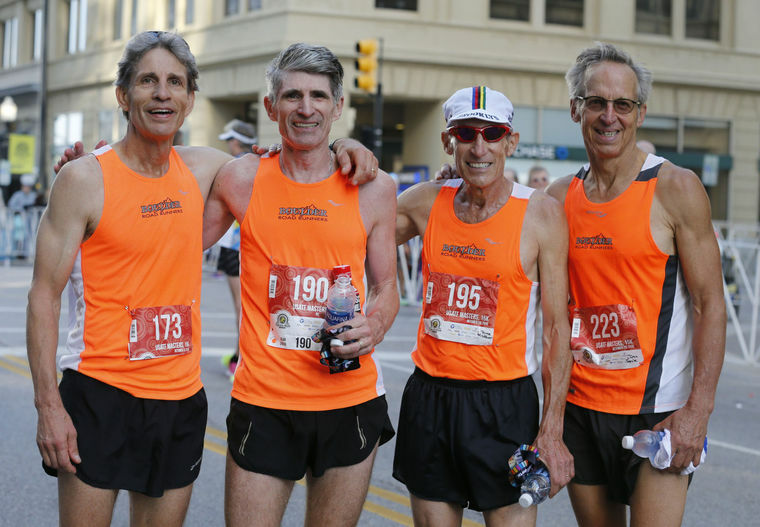 Beside the Men’s 60+ race discussed above, where the Boulder Road Runners came from behind to beat the Cal Coast team, the closest race was the Men’s 50+ where LRC Racing of Lincoln Nebraska, gave the Cal Coast team all they could handle. The absence of Matt Ebiner reduced Cal Coast’s margin for error. Rob Arsenault gave Cal Coast a three and a half minute advantage by clocking 54:42. Thomas Schumann came in next for Cal with a 12 second advantage over LRC’s Craig Christians. But then LRC got their 3rd runner in next, Bret Daugherty in 1:03:34. Vincent Lowder came as an insurance runner for Cal Coast and did not expect to be one of the scoring trio. Would he come in within 4 minutes of Daugherty? Indeed he would; Lowder crossed the finish line 2 minutes behind Daugherty to give the Cal Coast guys yet another win and a big lead in the Club Grand Prix. They have 480 of a maximum possible of 500 points. Other teams in contention included the KC Smoke with 45 points, the OK Runner Elite with 58 and the Ann Arbor Track Club with 64. The Impala Racing was the only complete team entered on the Women’s side; they win with a default score of 6 points. Hat’s off to the intrepid Masters Road Warriors who conquered the heat and the hills, learned something about themselves, and inspired others with their amazing performances!